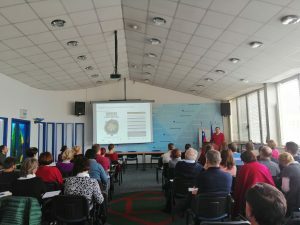 To celebrate the World Soil day in Slovenia, the Ministry of the Environment and Spatial Planning of Slovenia organised a meeting under the Slovenian Soil Partnership initiative, where different studies were presented. The lectures were held by the Geological Survey of Slovenia, Biotechnical Faculty, National Institute of Public Health, Ministry of the Environment and Spatial planning and the Agricultural Institute of Slovenia (Dr Vrščaj). Dr Borut Vrščaj had the opportunity to present the Links4Soils project and the Alpine Soil Partnership, the goals of the project, activities and our project partners! The soil is our most important ecosystem since it provides us with a range of ecosystem services such as food, clean water, raw materials, etc. A thin layer that covers the surface of the Earth, made up of distinct layers, called horizons, enables the life of animals and humans. There are many functions that soils perform, such as nutrient circulation, erosion prevention, filtering, carbon storage and biodiversity conservation, which are essential for life on this planet. Soils. We know more about the movement of celestial bodies than about the soil underfoot.